The two disciples Jesus selected to make preparations for the Passover had no idea that it would be the last meal they would share before Jesus would be handed over and killed. Along the way, Jesus told the twelve three times what would happen in Jerusalem. Yet, now that the plan was in motion, these two disciples were absolutely unprepared for the events of the next few days. 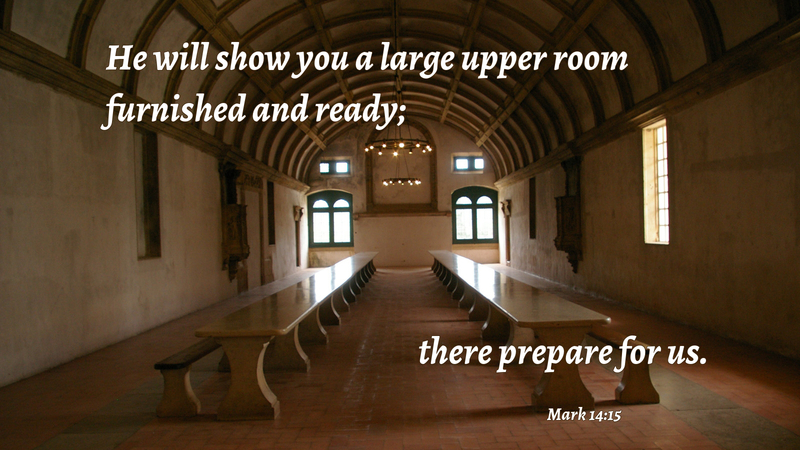 In the days leading up to this point, others were making preparations for Jesus. The Pharisees, scribes and chief priests secretly plotted to have Jesus arrested under false pretenses. In their view, Jesus was a danger and a threat to their status and way of life. At the house of Simon, a woman showed her love and devotion to Jesus by anointing him with expensive ointment. Her act of adoration prepared Jesus for the grave into which he would be laid. And finally, Judas Iscariot, having given in to the powers of evil, made preparations to betray the one who called him to take up his cross and follow. Entering into Holy Week, Christians also make preparations, asking themselves, “What things are left undone?” We have waved the palms; greeted and welcomed Christ into our midst as our King. Many have heard the reading of his Passion and prepare to worship during the service of Triduum. Those preparing for baptism have studied at the feet of their shepherd and anticipate their opportunity to confess their faith and receive God’s Spirit of adoption. The significance of the Sacrament of the Altar has been made known to those who will receive it for the first time. What is left to prepare? The day of preparation serves as our opportunity to once again enter into the mysteries of faith and be strengthened by the power of Christ’s victory. It is an opportunity to focus on the acts of discipleship; worship, prayer, reading Holy Scripture, fellowship and acts of love and service towards others. Such is the life Christ prepares and calls his followers to live. The two disciples making preparations for Jesus had no idea what was about to happen. Standing in a place two thousand years the other side of the empty tomb, today’s disciples know what they two could not. Now it is our turn to prepare ourselves, reaching out to others so that they may meet the risen Lord Jesus and rejoice in his victory over sin and the grave. Most merciful God, strengthen us by the power of your Holy Spirit, and prepare us for your kingdom. Amen. This entry was posted in Gospel According to Mark and tagged Christianity, Day of Preparation, discipleship, faith, Prayer, religion, Teaching of Jesus, Upper room. Bookmark the permalink.